So. 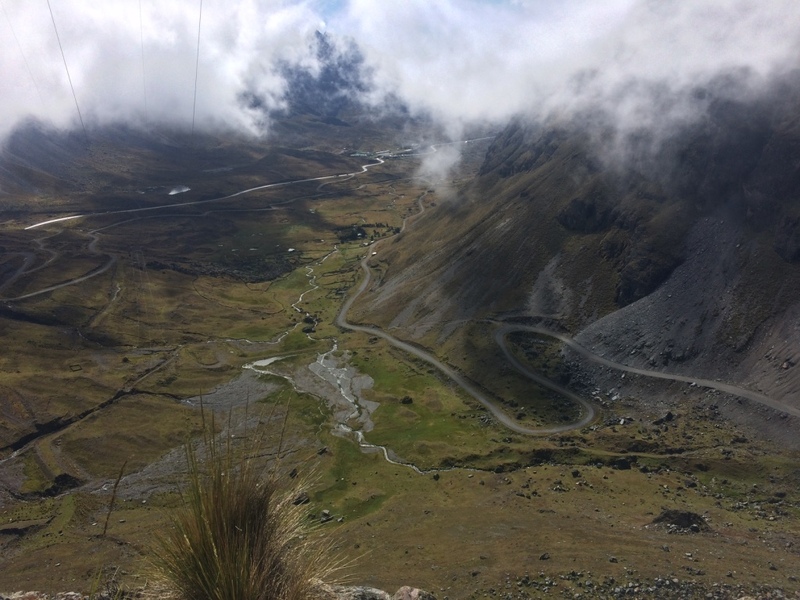 There's this road that is outside La Paz called Yungas Road that is colloquially referred to as "Death Road", because it is considered one of the most dangerous roads in the world. Death Road winds precariously up the side of a huge mountain, consists of steep hairpin turns/curves/declines, is paved with loose gravel, has no guardrails, is only wide enough to accommodate one car at a time, and most of the road stares down into steep cliffs and gorges and imminent death. Back in the day, over 300 people/year used to lose their life to this road - one false step, and you're basically over the side of a cliff into a super steep canyon below. I say "used to" because the government very recently built a new, safer highway route - so now cars and trucks increasingly use that route instead. 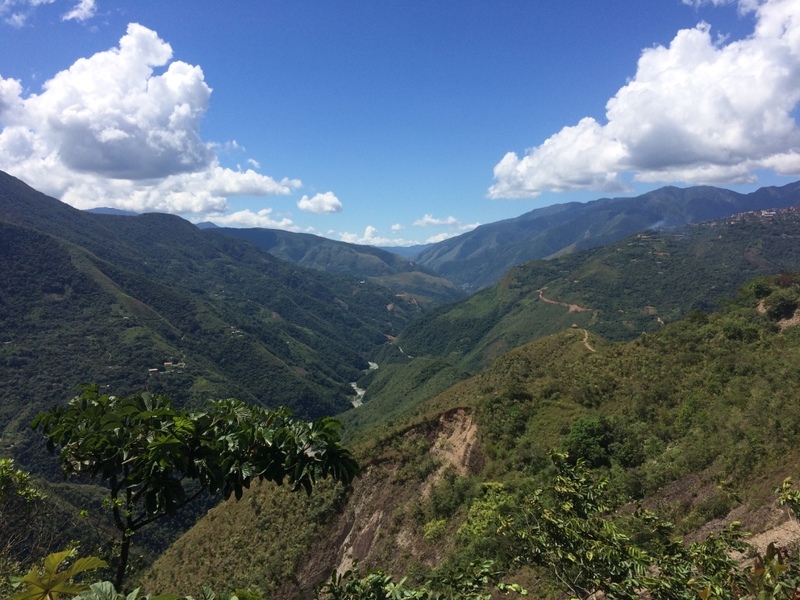 Nowadays, Death Road is only used by the locals who need it for transport, and daredevil mountain bikers who want to take their turn navigating the crazy turns and unstable gravel - the reward is the amazing views over mountains and canyons, and to say that you completed the crazy 61km descent. See that road? That is Death Road. To be totally honest, I'm not someone who gets a thrill out of life-threatening situations. I would much rather stay safe, instead of paying money just to feel the thrill of almost-dying (disregard bungee-jumping in South Africa and Victoria Falls plz; those were one-off situations). 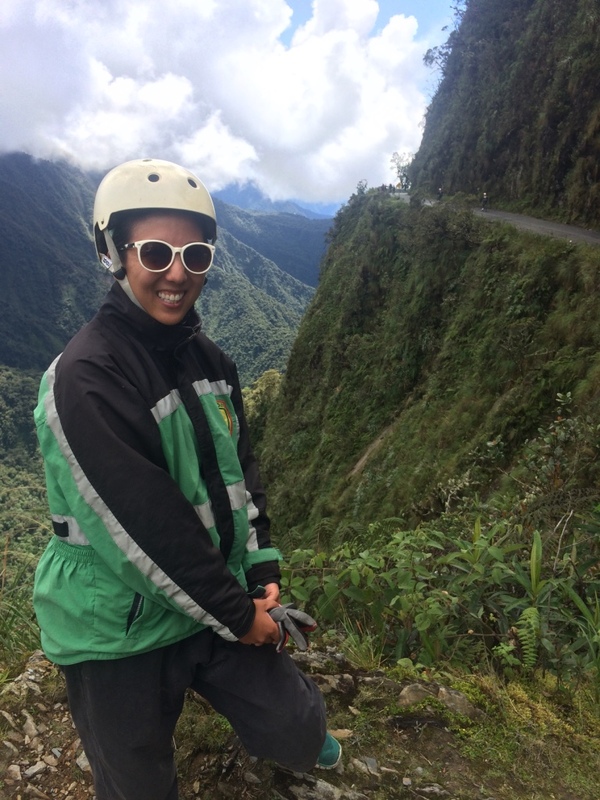 However, everyone who's biked down Death Road has RAVED about it - plus, I get by in life by assuming that I'm not the most incompetent person out there in the world. Therefore, if tons of other people have done Death Road and survived; I couldn't possibly be the most uncoordinated, destined-to-fall-over-the-side-of-a-canyon-one, could I? This reasoning would absolutely not hold up in court. But after debating with myself, I decided to sign up for a mountain biking trip on Death Road (and pay a little more for a reputable biking company with full shocks). The company I went with is called Barracuda Biking - they're well-established, have good-quality bikes (some of the discount companies are terrifying and the bike conditions aren't that great), and I didn't read any comments on TripAdvisor about people dying with this company. Sign me up! Left early morning for a 45-minute drive out to La Cumbre Pass, which sits over 15,000 ft. above sea level. Me looking like a super-nerd in my biking gear. 2 seconds later, the weather changed drastically and enveloped us all in a thick, dense fog. Group shot! There were 13 people on my trip. The first 20-or-so kilometers of Death Road are paved and have guardrails, so you can take some time to get used to the feeling of the bikes and turns. However, the road being paved also means there's lots of trucks and cars, so it was slightly terrifying to have huge 18-wheelers zooming by you on the curvy roads. 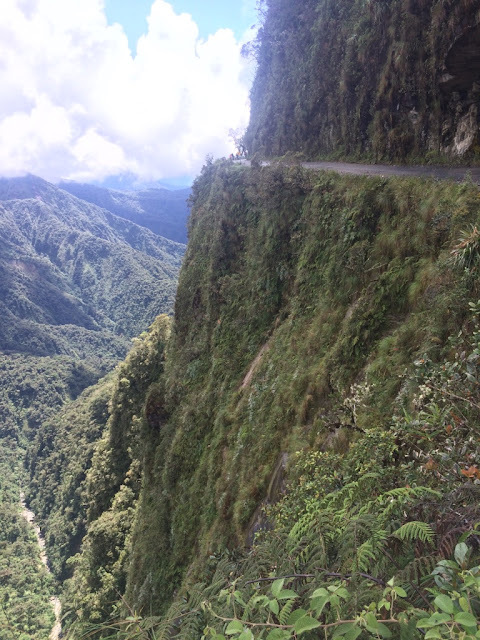 The best thing about Death Road is that the entire 61km descent is basically downhill - so you don't really have to utilize any athletic/exercise skillz. Besides the muscles in your hands that constantly have a death grip on the brakes. Let me tell you, after the whole thing was over, a bunch of us had the worst shooting pains up and down our forearms, wrists and fingers EVER - all from gripping the brakes on super bouncy/uneven roads. Another great thing about Death Road? We stopped a lot, so the guide could give us information on the area, what we were to expect on the next stretch of road, take photos, etc. Then came the scary part: the paved road disappeared, the road got narrower, and the ground became extremely uneven and full of loose rocks and gravel. The rest of the 30-40km on Death Road would now be on gravel. This is where the most injuries/fatalities occur, because it's easy to have the bike skid on loose rocks (AND PLUMMET OVER THE EDGE OF THE CLIFF), especially when taking tight turns or when the ground is wet (which it often is due to the many waterfalls in the area). Do you want to know a fun fact? There are tons of loose rocks in the road starting at this point, and the big ones are called "baby heads." Because they are the size of babies' heads. Charming. And we were off! Another nice part was that you could go as slow or fast as you wanted: there was always a guide in front and a guide in back. Also if you're wondering, they had a photographer who took all these photos and sent them to us later. Because obvi if safety is #1 in my mind, I'm not overly concerned with taking photos. 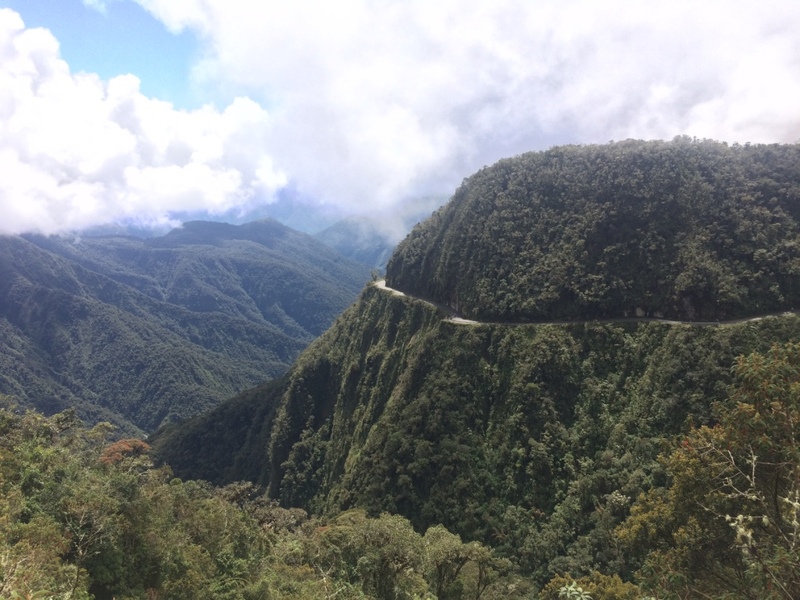 In Bolivia, people drive on the right side of the road and the drivers sit on the left side (just like the States) - however, on Death Road and Death Road alone, the rules are opposite. You're supposed to drive on the left side of the road, so that the left-side drivers going down can see how close they are to the edge up-close-and-personal. To try and prevent cars from falling over the edge, ofc. I looked like a super-nerd all day because all the gear was way too large on me; but hey, if it keeps me safe, I'm wearing it and never taking it off. It's crazy how you can see the road snaking through the side of the mountain. How did they even create this road. Who was in charge. So many questions. Oh lovely, and here's a good shot of what awaits at the edge of the road. Regardless of how crazy-scary the road is, the scenery was AMAZING. Since we kept descending, it was crazy how fast the temperature changed too. The top of the mountain was FREEZING, but as you keep going, the air temperature gets much warmer and more humid - you have to keep shedding layers. 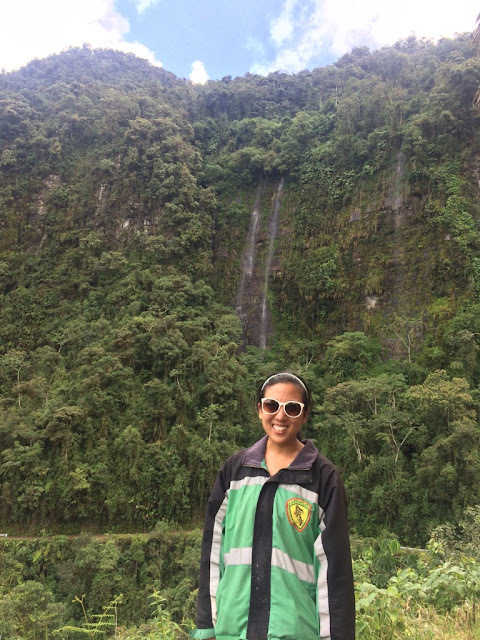 My XL coat, and more waterfalls! 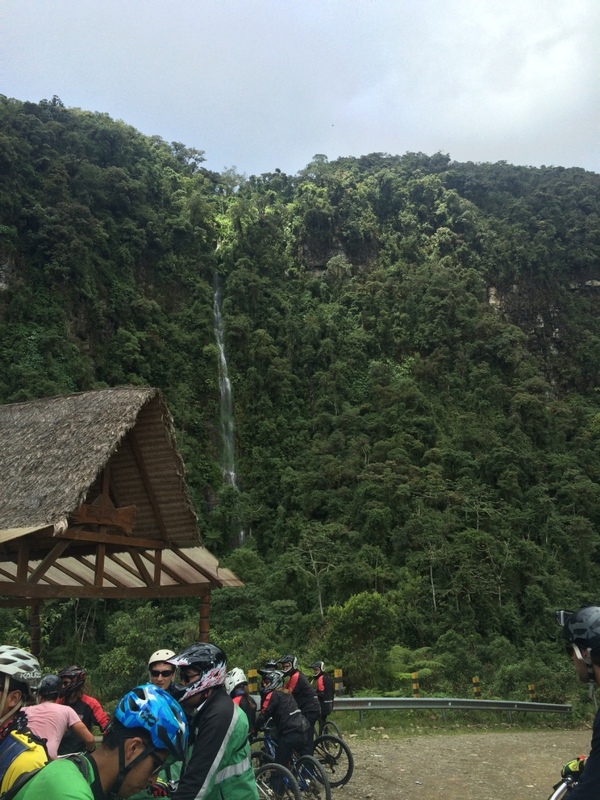 In a lot of parts, you had to ride your bike straight under the waterfalls - which means you got soaked, and you panicked the entire time because your bike got soaked, and you were scared it would catch or slip on something and send you over the edge. The entire road took us about 4-5 hours. It was really scary, but to be honest, it wasn't as scary as I thought it would be. For one, you're so focused on avoiding some of the big rocks on the road and guiding your bike down the least skid-worthy-looking path that you don't really even look over the edge. Also, you know what's the best thing ever invented? SHOCKS. Our bikes had these crazy, ridiculous shocks that absorbed a ton of the bumpy road (because seriously, you felt like you were getting thrown around in a washing machine as you were zooming down the super rocky roads, and it was a major challenge just keeping a grip on the handlebars). The biggest contributor to injuries and such are when people brake too hard and flip their bikes (and then go over the edge and die, which I'm going to continue saying over and over because that's how many times I said it to myself), so I spent the entire time trying to gently hit the brakes while trying to avoid skidding on loose gravel - which is actually really hard, because the road drops so steeply that your bike is constantly accelerating to terrifying speeds on its own. You know what makes it all worth it though? Views like this. The group after finishing Death Road, and having successfully shed all million layers we were wearing initially at the top. Because at this point, it was HOT and the road had gotten super dusty. It was like we went from tundra to desert in one day. After navigating down all 60km and having avoided any fatalities, the group was treated to lunch at a nearby hostel and allowed to hang out/swim in the pool or nearby river. My forearms felt like fire. And I got eaten by a million sandflies. But it was a great ending to the day. Actually, the day didn't end there. 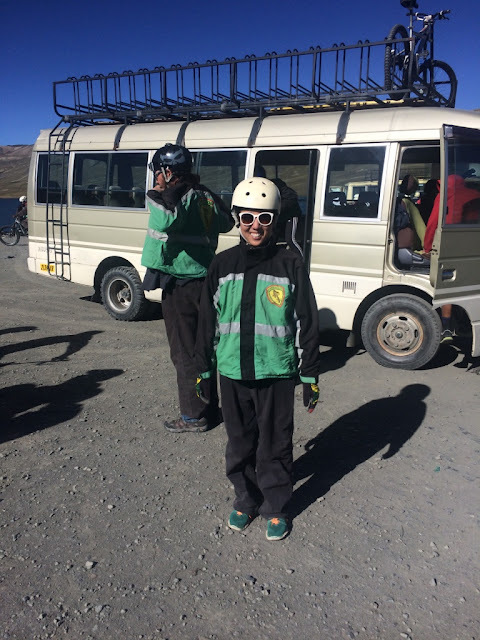 Having spent the entire day mountain biking 60km down the mountain, there was still the tiny problem of getting back to La Paz. From the ending point, La Paz was now a 3-hour drive away (instead of the initial 45-minutes). Ironically, we drove on the new, safer highway back to La Paz - you know, the one that was constructed after too many people were dying on Death Road. 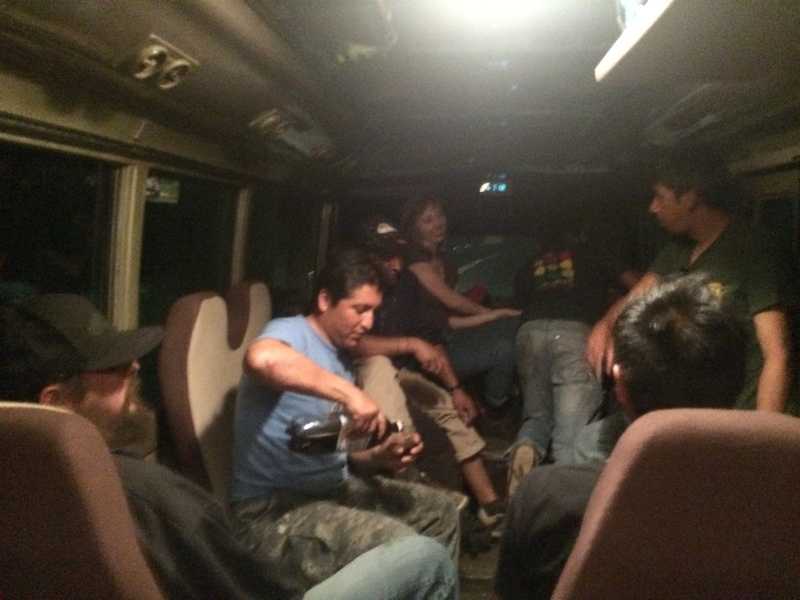 And you know what the guides normally do on the 3-hour journey back to La Paz? They make lots of pit stops, stock up on booze, and get wasted on the bus. Drink of choice: Cuba Libre, which is basically rum already pre-mixed with Coke. And they sell it in 2 liter-sized bottles with this ridiculous photo of a bikini-clad woman. There's no way that lady drinks Cuba Libres and looks like that, because these bottles are basically full of diabetes. Consequently, the bus ride home was the rowdiest bus ride I've ever been on in my life (I partially blame the 7 separate British dudes on my tour). There were shot-taking competitions, body surfing, and enough male shirtless-ness to last me for the next couple of years. People were so out of it that I wasn't even blacklisted when I took over the radio and played Justin Bieber's "Sorry" on repeat. Because that song is great. Guess who's NOT sorry? Me. Pun intended. 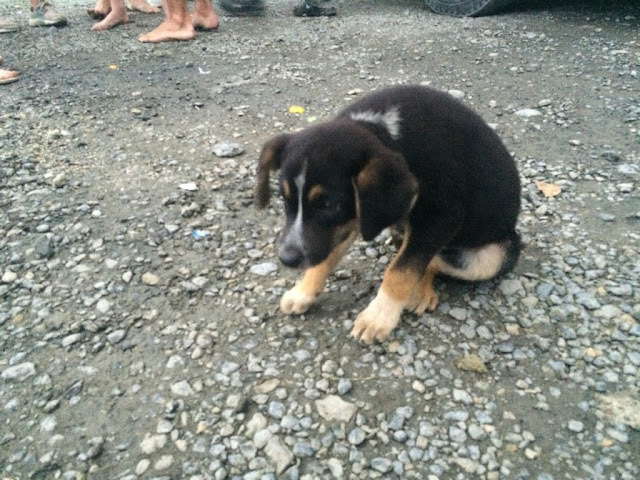 During an alcohol pit stop, I found a puppy! 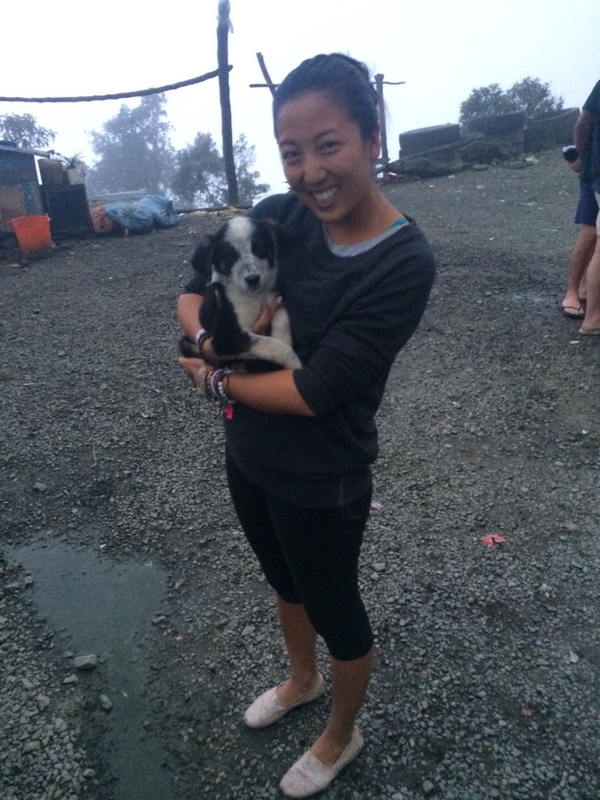 The cutest puppy ever. I may have tried to smuggle him onto the bus. PUPPPYYYYYY. I should also mention that this thing definitely had fleas. 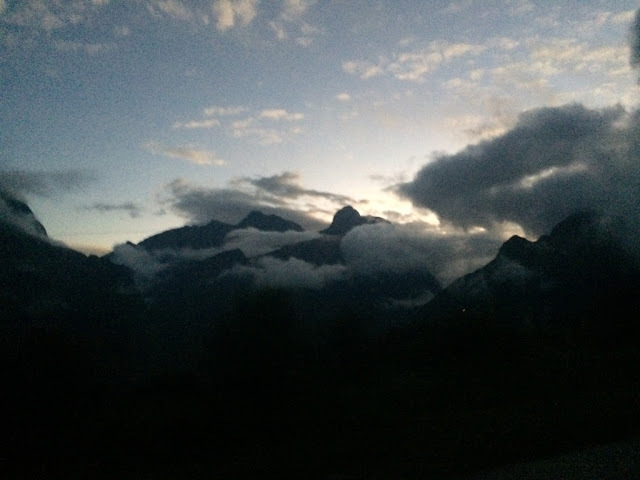 Setting sun views of the mountains and fog from the car window. So majestic. Overall (final word here, I promise), the entire experience was AMAZING (sign of being an American; using the word "amazing" too often). The views were unbelievable, and there was also the total thrill of rocketing down totally uneven gravel roads, being jostled up and down like crazy, navigating 180 degree turns, and splashing through waterfalls and rivers. To know that you are totally in control of avoiding (or hitting) rocks, or not driving yourself accidentally over the edge - it's pretty powerful. I can kind of see why people are so into downhill biking: you go SUPER fast, and anytime you successfully avoid an obstacle, you feel like a winner. Highly, highly recommend. Five stars.